A finial or hip-knob is an element marking the top or end of some object, often formed to be a decorative feature. 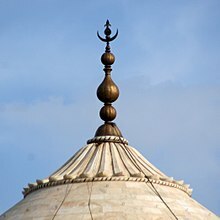 In architecture it is a decorative device, typically carved in stone, employed to emphasize the apex of a dome, spire, tower, roof, or gable or any of various distinctive ornaments at the top, end, or corner of a building or structure. Where there are several such elements they may be called pinnacles. Smaller finials in materials such as metal or wood are used as a decorative ornament on the tops or ends of poles or rods such as tent-poles or curtain rods or any object such as a piece of furniture. These are frequently seen on top of bed posts or clocks. Decorative finials are also commonly used to fasten lampshades, and as an ornamental element at the end of the handles of souvenir spoons. The charm at the end of a pull chain (such as for a ceiling fan or a lamp) is also known as a finial. During the various dynasties in China, a finial was worn on the top of the hats civil or military officials wore during formal court ceremonies. The finial was changed to a knob for other daily usage (including semi-formal ceremonies). The Pickelhaube is a Central European military helmet with a finial topped by a spike. A Balinese kemuncak on top of a thatched roof of a Balinese temple pavilion. In Java and Bali, a rooftop finial is known as mustaka or kemuncak. A "ball-style" finial is often mounted to the top of a stationary flagpole. The United States Army, Navy, Marine Corps and Coast Guard employ a variety of different finials depending on the flag in question, the Marines and Coast Guard deferring to the Navy's protocols. Bed posts and public garden (park) railings often end in finials. Wooden posts tend to have turned wood finials. While the purpose of finials on bed posts is mostly decorative, they serve a purpose on curtain rods, providing a way to keep a curtain from slipping off the end of a straight rod. Curtain rod finials can be seen to act much like a barometer of public taste. Many designs hark back to the Gothic and Neogothic of architectural finials, while other contemporary finials reflect minimalist, art nouveau and other traditional styles of décor. The use of different materials is as wide as the range of designs with brass, stainless steel, various woods and aluminium being employed with a variety of finishes such as ‘satin steel’ and 'antique brass'. The durability, strength and machinability of modern alloys have lent themselves to increasingly intricate and dazzling designs. Some lampshades or light fittings, especially in glass, typically terminate in a finial which also serves to affix the shade to the lamp or fixture. Finials are twisted onto the lamp harp. Typically the finial is externally decorative whilst hiding an internal screw thread. There are several standard thread sizes which are used. Greek and Cypriot flags being flown on flagpoles with cross finials in front of a church, Pafos. ^ Koppes, Wayne F.; Roehm, Jack M, eds. (1980). Metal Flagpole Manual. Chicago, Illinois: National Association of Architectural Metal Manufacturers. p. 21. ^ google search - bed post finials. Retrieved 2014-07-27. ^ google search - curtain rod finials. Retrieved 2014-07-27. Wikimedia Commons has media related to Finials. A spoon is a utensil consisting of a small shallow bowl, oval or round, at the end of a handle. A type of cutlery, especially as part of a place setting, it is used primarily for serving. Spoons are also used in food preparation to measure, mix, stir and toss ingredients. Present day spoons are made from metal, wood, porcelain or plastic. There are a wide variety of spoons that are made by different cultures for many different uses and foods. A lathe is a machine that rotates a workpiece about an axis of rotation to perform various operations such as cutting, sanding, knurling, drilling, deformation, facing, and turning, with tools that are applied to the workpiece to create an object with symmetry about that axis. A chandelier is a branched ornamental light fixture designed to be mounted on ceilings or walls. Chandeliers are often ornate, and normally use incandescent light bulbs, though some modern designs also use fluorescent lamps and recently LEDs. The Victoria Tower is the square tower at the south-west end of the Palace of Westminster in London, facing south and west onto Black Rod's Garden and Old Palace Yard. At 98.5 metres (323 ft), it is slightly taller than the more famous Elizabeth Tower at the north end of the Palace. It houses the Parliamentary Archives in archive conditions meeting the BS 5454 standard, on 12 floors. All 14 floors of the building were originally linked via a single wrought-iron Victorian staircase of 553 steps, of which five floors survive. A curtain is a piece of cloth intended to block or obscure light, or drafts, or water. A curtain is also the movable screen or drape in a theater that separates the stage from the auditorium or that serves as a backdrop. A kakemono , more commonly referred to as a kakejiku , is a Japanese hanging scroll used to display and exhibit paintings and calligraphy inscriptions and designs mounted usually with silk fabric edges on a flexible backing, so that it can be rolled for storage. Moulding, also known as coving (United Kingdom, Australia), is a strip of material with various profiles used to cover transitions between surfaces or for decoration. It is traditionally made from solid milled wood or plaster, but may be of plastic or reformed wood. In classical architecture and sculpture, the molding is often carved in marble or other stones. A tea caddy is a box, jar, canister, or other receptacle used to store tea. When first introduced to Europe, tea was extremely expensive, and kept under the eye of the mistress of the house, often under lock and key. The containers used were therefore often expensive and decorative, to fit in with the rest of a drawing-room or other reception room. Hot water was carried up from the kitchen, and the tea made by the mistress of the house, or under her supervision. A lampshade is a fixture that covers the lightbulb on a lamp to diffuse the light it emits. Lampshades can be made out of a wide variety of materials like paper, glass, fabric or stone. Usually conical or cylindrical in shape, lampshades can be found on floor, desk, tabletop, or suspended lamps. The term can also apply to the glass hung under many designs of ceiling lamp. Beyond its practical purpose, significant emphasis is also usually given to decorative and aesthetic features. A lamp shade also serves to "shade" human eyes from the direct glare of the light bulbs used to illuminate the lamp. Some lamp shades are also lined with a hard-backed opaque lining, often white or gold, to reflect as much light as possible through the top and bottom of the shade while blocking light from emitting through the walls of the shade itself. In other cases, the shade material is deliberately decorative so that upon illumination it may emphasize a display of color and light emitting through the shade surface itself. A bed frame or bedstead is the part of a bed used to position the mattress and base (foundation), and may include means of supporting a canopy above. Bed frames are typically made of wood or metal. A bed frame includes head, foot, and side rails. It may also include slats to support the mattress, in which case a separate base is not necessary, as in a platform bed. Most double (full) sized beds, along with all queen and king size beds, require some type of center support rail, typically also with extra feet extending down to the floor. The term "bed frame" was first used in 1805-1815. A curtain rod, curtain rail, or traverse rod is a device used to suspend curtains, usually above windows or along the edges of showers or bathtubs, though also wherever curtains might be used. When found in bathrooms, curtain rods tend to be telescopic and self-fixing, while curtain rods in other areas of the home are often affixed with decorative brackets or finial. A canopy bed is a decorative bed somewhat similar to a four-poster bed. A typical canopy bed usually features posts at each of the four corners extending four feet high or more above the mattress. Ornate or decorative fabric is often draped across the upper space between the posts and a solid swath of cloth may create a ceiling, or canopy directly over the bed. A souvenir spoon is a decorative spoon used as a memento of a place or to display as a 'trophy' of having been there. The spoons may be made from a number of different materials such as sterling silver, nickel, steel, and in some cases wood. They are often hung on a spoon rack and are typically ornamental, depicting sights, coat of arms, associated characters, etc. The year the spoon was made may be inscribed in the bowl, or on the back. The entire spoon, including the bowl, handle, and finial may be used to convey the theme. The first souvenir spoons in the United States were made in 1890 by Galt & Bros., Inc. of Washington D.C., featuring the profile of George Washington. Although the George Washington spoon was one of the most popular designs, relatively few made by Galt & Bro. remain in circulation. One year later, a souvenir Salem Witch spoon was made, and sold seven thousand copies. It was created by Daniel Low, a jeweler in Salem, Massachusetts, after he saw souvenir spoons on vacation in Germany. The Witch Spoon is given credit for starting the souvenir spoon hobby in the U.S.
Metals used for architectural purposes include lead, for water pipes, roofing, and windows; tin, formed into tinplate; zinc, copper and aluminium, in a range of applications including roofing and decoration; and iron, which has structural and other uses in the form of cast iron or wrought iron, or made into steel. Metal alloys used in building include bronze ; brass ; monel metal and nickel silver, mainly consisting of nickel and copper; and stainless steel, with important components of nickel and chromium. Mosque lamps of enamelled glass, often with gilding, survive in considerable numbers from the Islamic art of the Middle Ages, especially the 13th and 14th centuries, with Cairo in Egypt and Aleppo and Damascus in Syria the most important centres of production. They are oil lamps, usually with a large round bulbous body rising to a narrower waist, above which the top section is flared. There is usually a foot so they can be placed on a surface, but they were normally used suspended by chains that went through a number of loops on the outside of the body. They were used to light mosques and other buildings in mosque complexes, in large spaces in groups hanging from a circular metal frame. The circular frames continue to be used in many mosques today, but with plain or frosted glass lamps for electric lighting. The use of bronze dates from remote antiquity. This important metal is an alloy composed of copper and tin, in proportion which vary slightly, but may be normally considered as nine parts of copper to one of tin. Other ingredients which are occasionally found are more or less accidental. The result is a metal of a rich golden brown colour, capable of being worked by casting — a process little applicable to its component parts, but peculiarly successful with bronze, the density and hardness of the metal allowing it to take any impression of a mould, however delicate. It is thus possible to create ornamental work of various kinds. A curtain tie-back is a decorative window treatment which accompanies a cloth curtain. Within the field of interior decoration, tie-backs made of fabric are classified as a kind of "soft furnishing" while those made out of wood, metal, or glass are considered "window hardware".